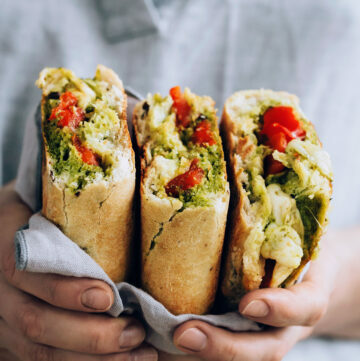 Bone broth is all the rage right now, but if you don’t eat meat, take heart: even though vegetarian bone broth isn’t a thing, vegetarians need not miss out on the nutritional benefits of bone broth! 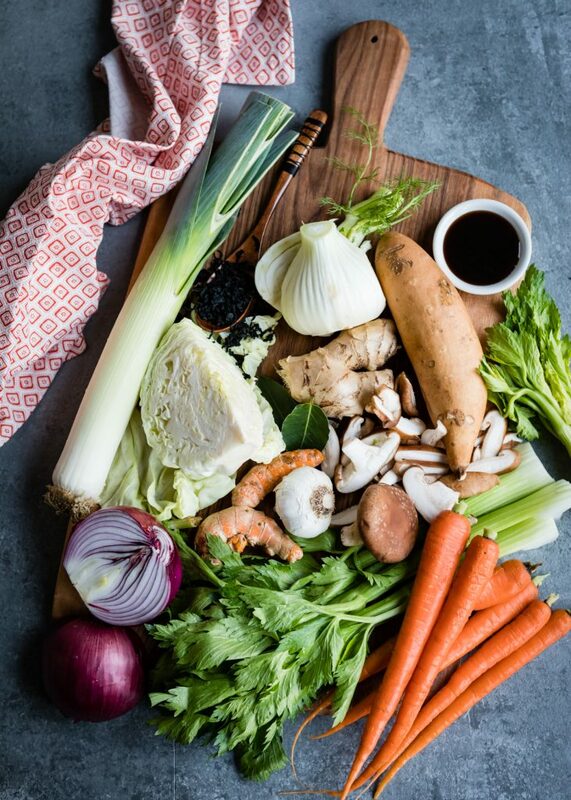 Some of the same nutrients can be duplicated in a nutrient-dense, delicious vegetarian bone broth substitute made from a combination of organic vegetables, wakame, water, herbs, and spices. 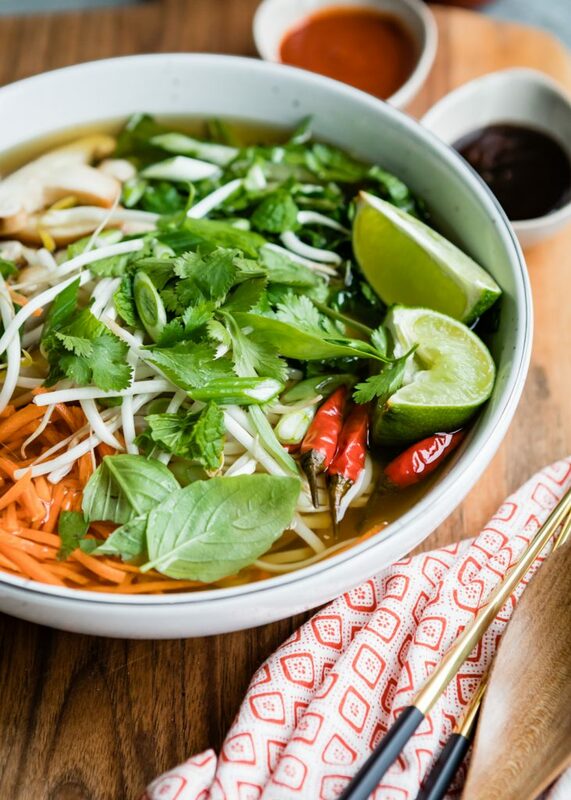 Warm, comforting, and healing, this broth is also easy to make, not to mention flavorful–and it makes the perfect base for Vegetarian Pho. It could be tempting to just buy veggie broth and call it good. But really, a lot of store-bought broths are full of salt and not much else. 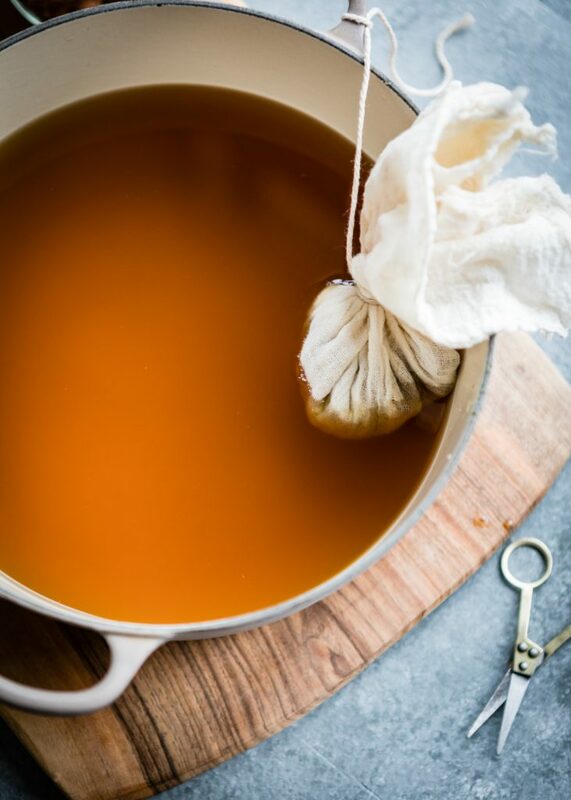 Making this vegetarian bone broth alternative from scratch is easy to do. 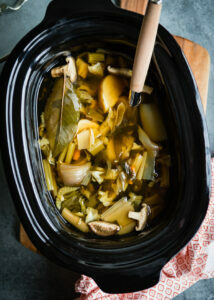 I find that I make broth most often when I have a bunch of veggie scraps and odds and ends. It’s easy to tuck them away in the fridge or freezer until you have enough to make a big batch of broth. You may remember hearing that nutrients are leached out of vegetables into their cooking water. Well, it’s true! And this recipe capitalizes on that. Vitamins and minerals are released into the water as the broth simmers. Straining the broth removes the solids, leaving behind those nutrients that are easily digested by the body. In addition to the nutrients, vitamins, and minerals, the flavor of this broth is fantastic. 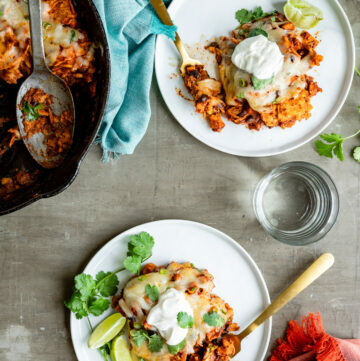 The long cooking time yields mega flavor and allows the flavors to blend and mellow. You can certainly use any vegetables you like in this vegetarian bone broth substitute. The sky’s the limit! 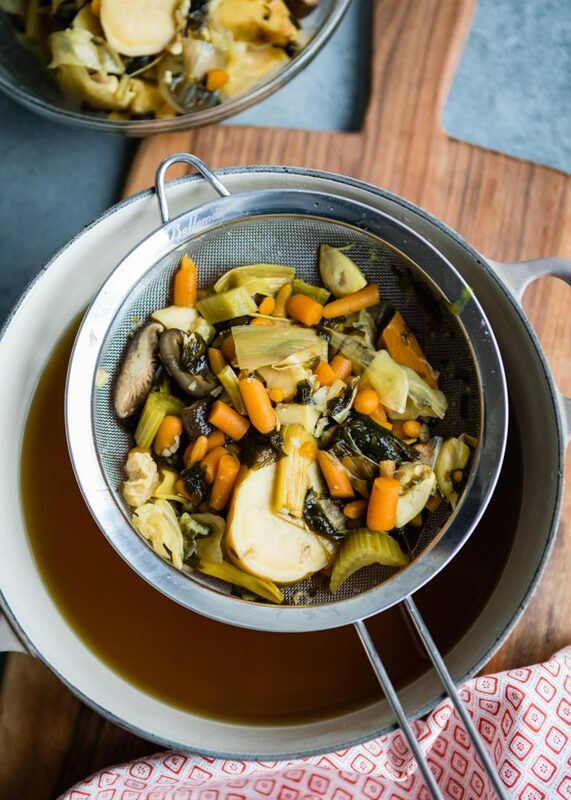 I tend to go with easy-to-find veggies and aromatics for a richer tasting broth. For added minerals and other nutrients, I add wakame (seaweed), coconut aminos (you could use soy sauce instead), mushrooms (umami flavor), ginger and turmeric (fresh if possible! ), along with plenty of leafy greens. You can also add in those veggie trimmings and peelings I mentioned–a great way to eliminate kitchen waste! Shiitake mushrooms contain 18 amino acids (all 8 essential amino acids included) plus over 30 enzymes, and whether used dried or fresh, add B vitamins, copper, manganese, selenium, zinc, vitamin D. It’s definitely worth including these mushrooms in veggie broth. (source) They also add an earthy, “meaty” umami flavor. A quick note about wakame (seaweed). You can find it dried in packages in the Asian section of well-stocked grocery stores, health food stores, and online. And if you can’t find it in stores or online, nori is a great substitute. 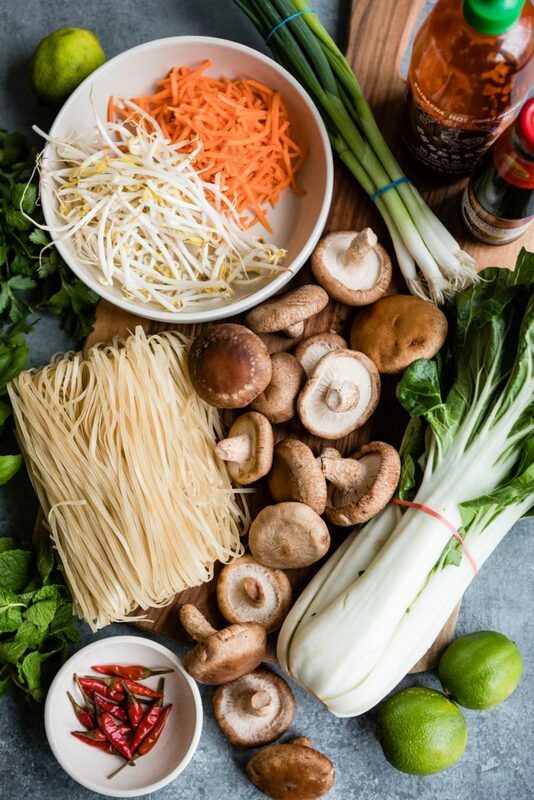 It adds minerals and other collagen-boosting nutrients to the broth along with a distinct flavor that works particularly well for Asian dishes, such as pho. It kind of helps replace the flavor of the fish sauce that would normally be added in. Seaweed is high in potassium, iron, calcium, iodine and magnesium. The other veggies and aromatics add even more vitamins and minerals. While my vegetarian bone broth substitute doesn’t contain collagen, adding these items can help boost the body’s collagen production. Vitamins A, C, and E are particularly important for collagen production. This broth contains all three. Consuming this vegetarian bone broth alternative alone is perfectly delicious, but we also like to use it as a base for Vegetarian Pho. I’ve included a basic recipe for the broth as well as a recipe for pho. Be sure to check out the notes for a few shortcuts if you want to make the broth specifically to use for pho. 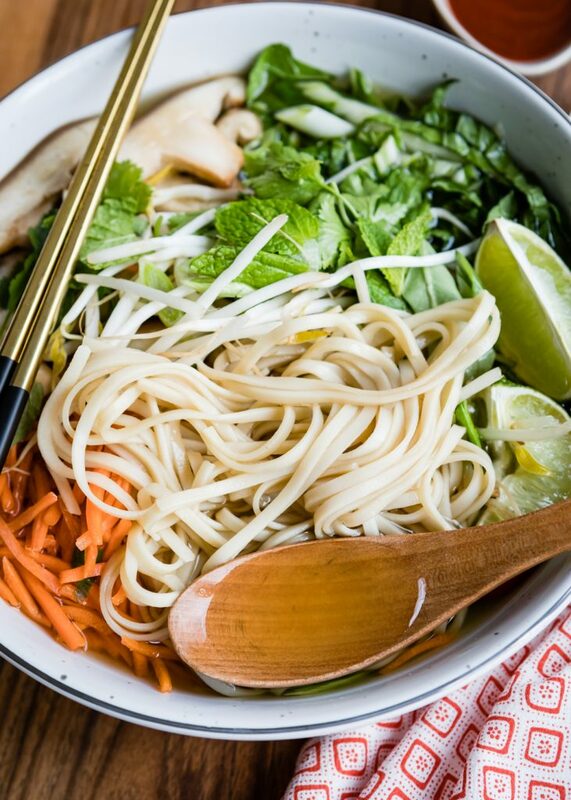 The integral part of any pho recipe is the deeply flavored broth. The piping hot broth is ladled over cooked rice noodles, veggies, and a protein or meat–in this instance I’ve used meaty shiitake mushrooms. And to top it off, a handful of bean sprouts, fresh herbs, green onions, a squeeze of fresh lime juice, and hot chiles. 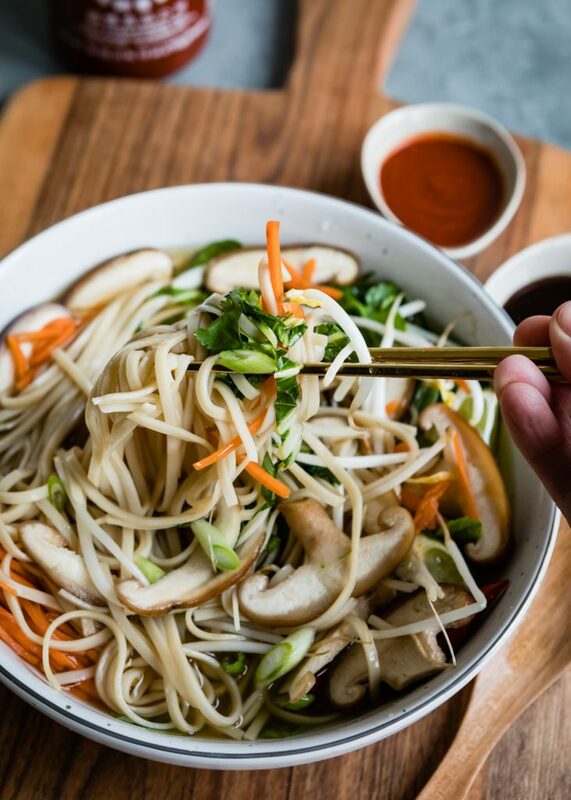 Traditionally pho is served with a side of hoisin sauce and Sriracha, but you can also drizzle them on top if you like. As I mentioned, the vegetarian bone broth is a great base for pho. To add some authentic flavor, I simmer a sauce packet (or whole spices tied in cheesecloth) to add some extra flavor. 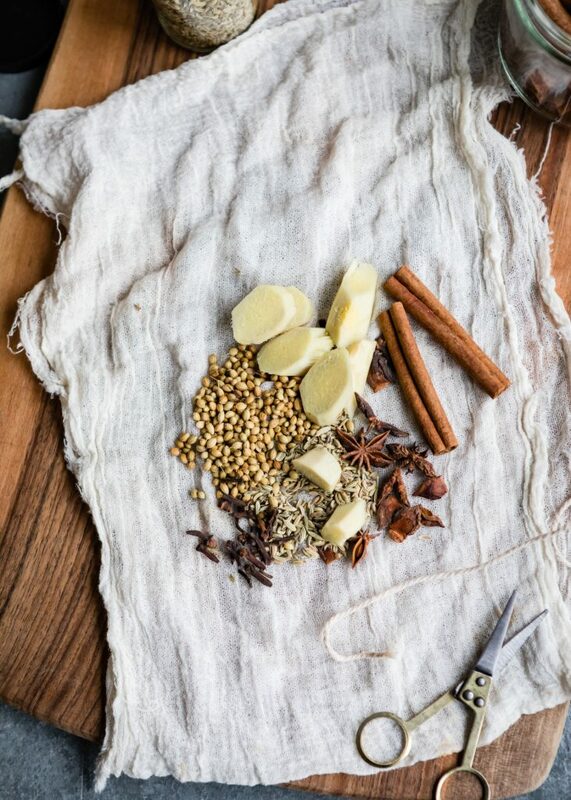 I include dried coriander berries, whole fennel seeds, whole cloves, star anise, cinnamon sticks, and fresh slices of ginger root. If you plan ahead of time to make pho with the vegetarian bone broth substitute, you can add these into the broth during the initial cooking time and then the broth will be ready to go without the extra step. 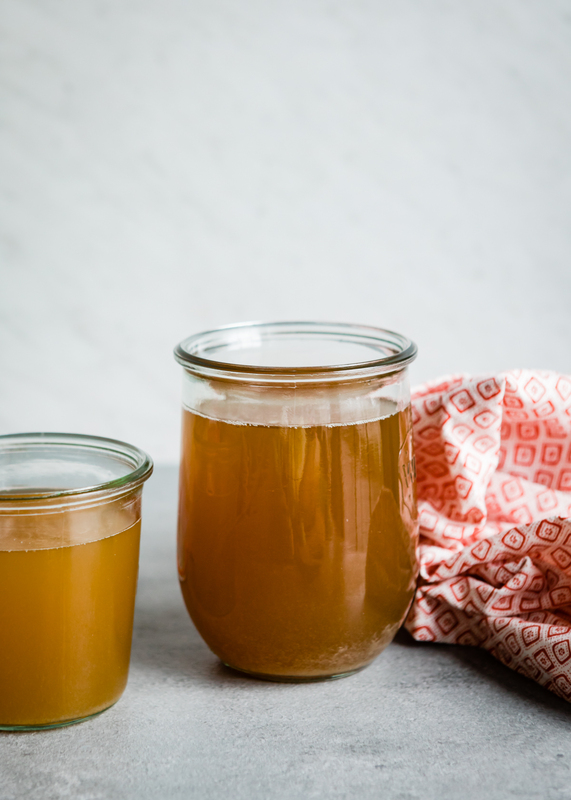 Full of minerals, vitamins, and other nutrients, this vegetarian "bone" broth is easy to make and can be consumed as-is or used as the base for soups and stews, and more to add extra nutrition and flavor. Wash and rinse all veggies well before slicing or chopping. Place in a large stockpot or slow cooker. Add the ginger, turmeric, garlic cloves, bay leaves, wakame, coconut aminos, and any other herbs or spices. Cover with the water. With a slotted spoon, remove the solids from the pot or slow cooker. Set a large fine mesh strainer over a big bowl or another pot and strain the broth. If not using immediately, transfer the broth to jars or other airtight containers. Let cool slightly before placing in fridge or freezer. Broth should keep well for about 3-5 days in the fridge and several months in the freezer. This broth has very little salt (except for the aminos), so add salt to taste according to how it will be used in recipes. Feel free to substitute or add any vegetables you have on hand or prefer over the ones listed above. Add in various spices and herbs according to how it will be used in recipes or according to preference. Example: thyme, parsley, sage, and rosemary for savory recipes; or cilantro, cumin seeds, and chili peppers for Mexican or Indian recipes, etc. 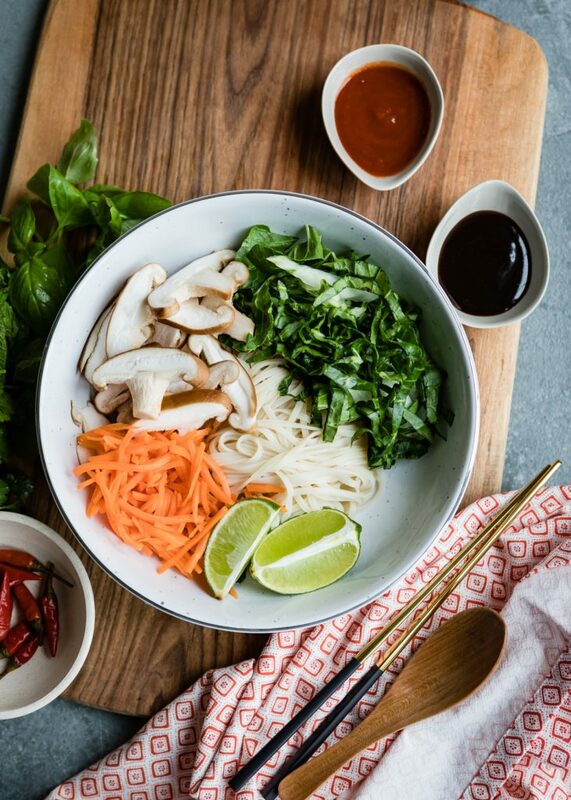 This pho starts with a base of richly flavored and nutritious vegetarian "bone" broth that is then ladles over cooked rice noodles, shiitake mushrooms, and vegetables for a hearty, satisfying meal. Place in a pot with the vegetable broth and tamari. Bring to a simmer. Prepare spice packet by placing spices into several layers of cheesecloth and tying closed with kitchen twine, then place it in the simmering broth. Simmer for at least 15-20 minutes, preferably longer to allow flavors to infuse the broth. 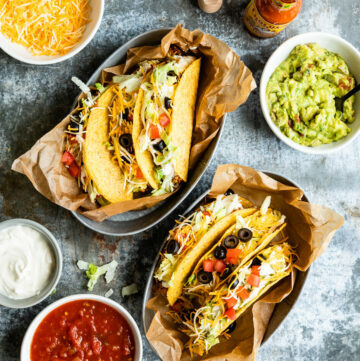 Remove spice packet and discard. Meanwhile, cook the rice noodles according to package directions and rinse well under cold water. Set aside until ready to assemble. To assemble the pho, have ready four shallow, wide bowls. Divide the noodles between the bowls. Top with the thinly sliced mushrooms, bok choy, and carrots. Ladle the hot broth over the top. (It should wilt and soften the veggies. If you prefer more tender veggies, lightly saute them in oil before assembling bowls.) 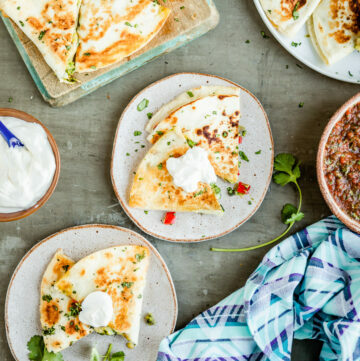 Top each with bean sprouts, a handful scallions, fresh herbs, lime wedges, and Thai bird chiles. 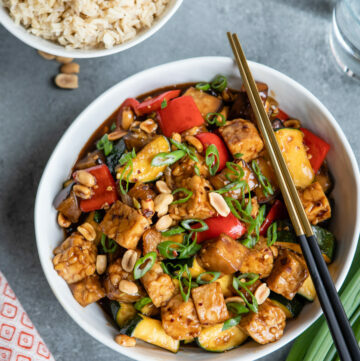 Serve with shallow dishes of hoisin and Sriracha on the side along with chopsticks and broth spoons. If preferred, sauté the bok choy, shiitake mushrooms, and carrots in a little oil before adding to the noodles. 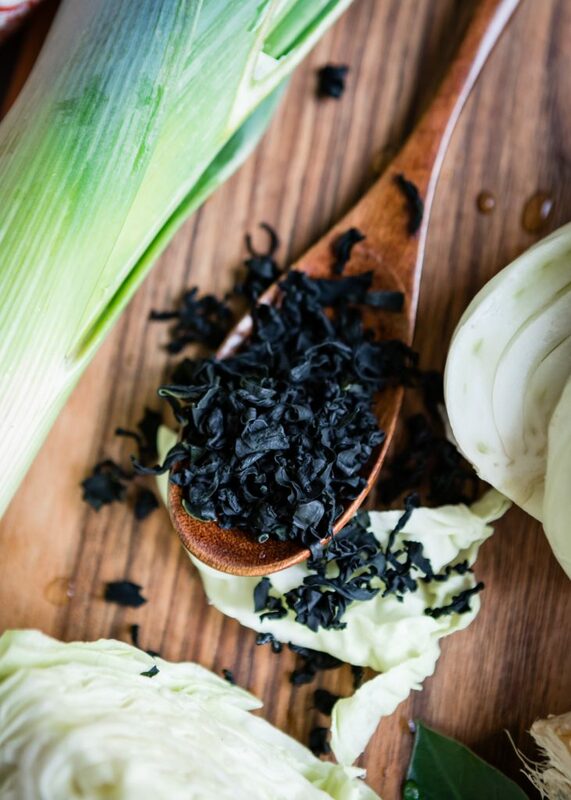 Other leafy greens such as thinly sliced kale, napa cabbage, or collard greens can be used in place of the bok choy. Feel free to add or omit other vegetables according to preference. Rice noodles can be found in the Asian section of most grocery stores or online. For a low carb version, substitute spiralized vegetables for the rice noodles.